Sick, tired, overweight, obese, taking aspirin, taking medication, unhappy, lethargic? Raw foods give the gift of life. If you plant a fruit, nut, or seed in the ground, you will grow a tree or plant. If you plant a burger and fries or a slice of bread, you will get mold. On our coaching call for the Total Wellness Cleanse the other night, we talked exclusively about allergies and how they come about. After the call, I was thinking – no wonder people develop allergies to even raw foods – in my case it’s pineapple and eggplant that give me extreme problems. Over years of abuse from cooked and processed foods, not to mention loads of sugar to feed the eager beaver yeastie eaters (Candidiasis), my digestive system was in such turmoil that my immune system responded unfavourably toward undigested raw foods as well. Once the intestines have been irritated so much, undigested food particles obtain access to the blood stream, and the body launches all out war against the alien particles. Antibiotics, sugar, wheat, processed foods, etc. open the door for disbiosis, altered balance of the gut microflora, and consequently a yeast problem in the gut. Once this happens, allergies present themselves. And I’m not talking about just the life or death allergies, but food intolerances that make you feel slow, tired, brain foggy, and simply tired all over. And you may not even know about them! All you can do at this point is continue to feel lethargic, or you can turn your life around and GO RAW NOW! Everyone agrees that we should eat more fruits and vegetables. But they think I’m some weird granola child when I tell them that I don’t cook my food! What gives? Maybe they are jealous. Maybe they think they could never live this life. Maybe they are too bogged down by cooked, processed food to open up their minds to the idea. Or maybe, just maybe, they are sick and tired enough to see the light. You can feel healthy and vibrant. If you think you can’t, you can’t. If you think you can, you can. Every single person has it in them to feel their best ever. And the best thing is – it’s your choice. You can change your life right this second. What’s it going to be? Last night we had the best dinner, and in spite of what you may think it was incredibly easy to put together – but, a dehydrator is a necessity. So if you don’t have one…it’s time to invest in one! Honestly though, if you don’t have a dehydrator you could just throw the ingredients (plus some fresh corn kernels) in a bowl and have an enchilada salad! Place all ingredients in a food processor and pulse until well combined. Then mix until smooth. Spread thin on a dehydrator sheet in whatever shape you desire and dehydrate at 110 F for 4-5 hours or until no longer doughy on top. Flip and dehydrate another 3-4 hours. Place all ingredients in a food processor and pulse until desired consistency is reached. Raw Cashew Cheese Sauce – Seriously the best ever! Place all ingredients in a food processor and pulse until combined, slowly adding water until the consistency you desire is reached, keeping in mind that it will get thicker as it sits and the cashews have a chance to absorb the water. Alternatively you can also blend in a high speed blender to get a velvet smooth consistency. To assemble the enchilada I just chopped up some lettuce and tossed it on the corn tortilla, layered it with guacamole and rolled it up. We splashed on the tomato and cheese sauces and quickly took a picture (which is obviously not too artistic) just before our ravenous stomachs got a hold of it! Place all ingredients in a high speed blender and blend until smooth. If you don’t have a high speed blender like the vitamix, you can place all ingredients in a blender and let them sit for a couple of hours until the cashews and dates soften. I HIGHLY recommend investing in a vita-mix. It’s so powerful that it can turn an ipod into dust – I’m sure you can find some interesting videos on youtube. I use my vita-mix at least 4 times a day. You can make nut milks without having to use a strainer, and make the smoothest raw cheesecake you’ve ever tasted. And since I happened to have fresh strawberries in the fridge – voila! 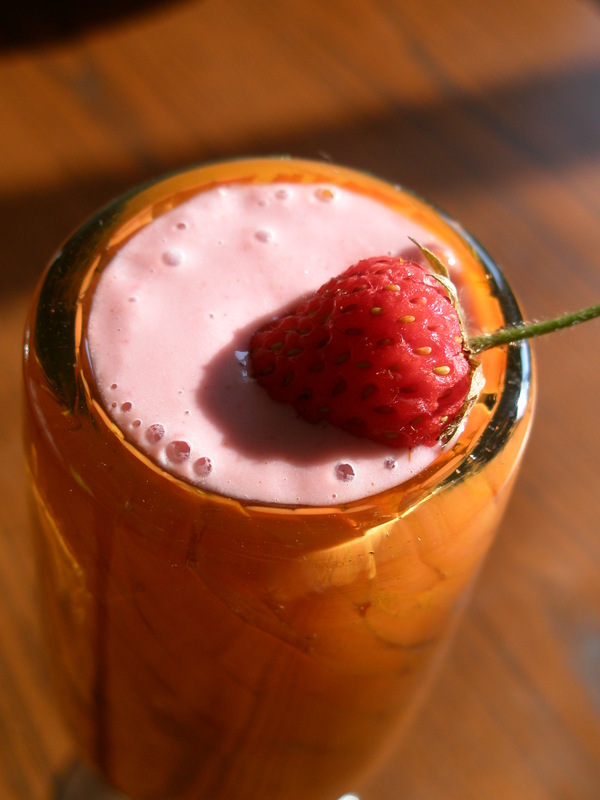 Instant strawberry shake. Blend all ingredients in a high powered blender until smooth. The funny thing about strawberries is that when you pick them yourself, their size range from that of a raspberry to…a slightly larger raspberry! They taste so sweet and just downright incredible. When you buy them imported from who knows where, they’re the size of peaches and they taste sour and just gross! If you missed them this time around, don’t miss out on picking your own (or buying, although picking your own can be fun) local berries next season! Spirulina: Why I Eat It Every Day. The question I get asked most often when I tell people that I eat raw, vegan food is: Where do you get your protein? The simplest answer: spirulina. “Spir-what?” They ask. So rather than explain myself over and over again, I thought I’d just write about it and refer people to this website.Spirulina is an amazing superfood. I guess you could say that spirulina is my preferred source of protein, although that isn’t my main objective in eating it. To be honest, I am a firm believer that all foods in nature have the perfect amout of fats, carbohydrates, and protein, so I never strive to get any single macro-nutrient. I just eat a wide variety of foods and listen to my body. Society, on the other hand, seems to be obsessed with the protein question, and if you’re one who is protein obsessed, this may be your reason to include spirulina in your diet! Spirulina is a complete protein, which means that is contains all of the essential amino acids. It’s also rich in EFAs: GLA, ALA, LA, EPA, DHA, and AA. If you don’t understand what those mean, don’t sweat it. Just think Omega 3s! Spirulina is also loaded with vitamins and minerals – just look at its colour. Anything THAT green is golden for the body. Everyone could use more greens in their diet, that’s for sure. What I can say for certain is that spirulina gives me loads of energy every time I eat it. And at the moment, my favourite way to eat spirulina is in a smoothie loaded with local, fresh berries! It’s amazing the effect that eating raw has on my desire to exercise. Last night I took the dog for a 5 k run. Today after work I went to a hot yoga class, and after I biked home I went for another run with a friend. It’s really nice to have a running partner because you have that little bit of added motivation. When you have someone calling you and asking if you want to go running, it’s like an alarm going off and motivation calling you! If you get several running partners, there’s a guarantee you’ll be running a few times a week! I haven’t had much to eat today, which is kinda weird considering the amount of exercise I’ve had, but I don’t feel much like eating anything right now. When you eat raw, natural, good quality foods, you are more in touch with your nutritional needs, wheras when I eat cooked foods, I think I need food all the time! I’d eat late at night all the time when I was on cooked food. When I eat raw, I only go into the kitchen when I am truly hungry…or if I can’t wait to try a new raw recipe! Also, on cooked I always cleaned my plate, but on a raw food diet, I just stop eating when I’ve had enough. I eat raw dessert for breakfast if I feel the desire! And when I have dishes that are rich in nuts or other heavy raw ingredients, my body steers me clear of them for a few days. Never, ever on a cooked diet did my body tell me anything! I remember years ago when I didn’t have any idea the effects that food had on my mood or energy level. Now, I know the second I have eaten something that doesn’t agree with me. I can just feel it. And since you only eat when you’re hungry on raw, there is no breakfast, lunch, dinner schedule…you eat on your own hunger schedule…that being said, I think my hunger level just rose…so apparently “dinner” tonight is going to be around 11pm! Would I Make It Again: Yes! Ingredients: 1 cup leftover Marinara Sauce, (recipe in Eating for Energy) an avocado, 6 stalks asparagus, 1 yellow pepper, 3 green onions, and 1/2 a cucumber. Variations: Whatever you have in the fridge! Then it was off to pick berries at Whittamores Farm on Steeles Ave. So many delicious berries! I think we picked for a couple of hours, and I got sunburnt 🙁 but it was worth it.